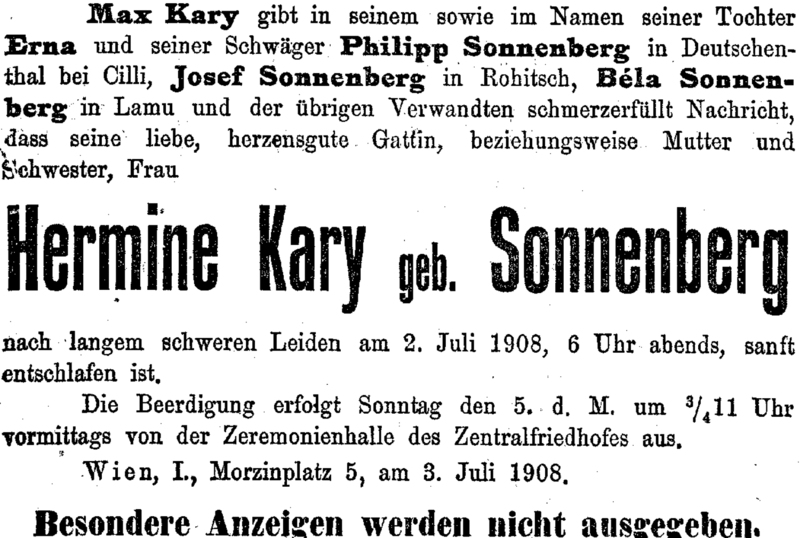 Samuel Siegmund KARY Born: Jan 3, 1840 in Stupava (Stampfen), Malacky, Bratislava, Slovakia. Residence: 1857 in Vienna Stadt No. 452 = Sterngasse 13 flat #11, together with Salomon Geiringer according to Conscriptionsbogen. 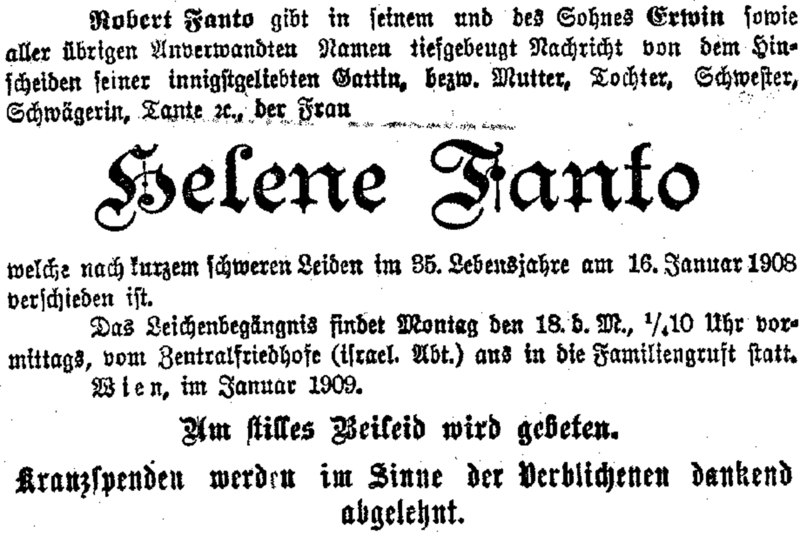 Died: Dec 19, 1899 in Mariannengasse 20, Vienna-9 (Bauchfellentzündung), Austria age 60 bur. Zentralfriedhof-I Tor group-20 row-1 grave, NFP + Emma OPPENHEIM Born: Apr 6, 1847 in Bratislava (Pressburg), Slovakia. 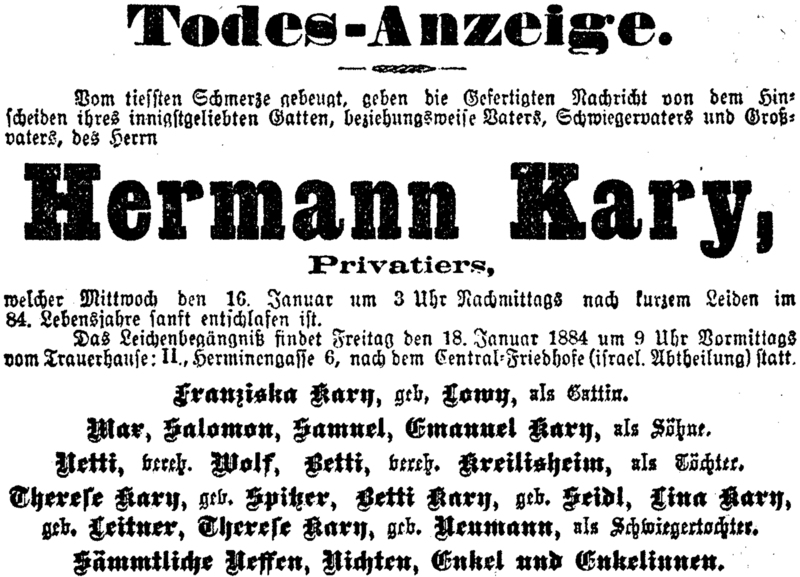 Married: Mar 22, 1868 in Vienna *anno-search. 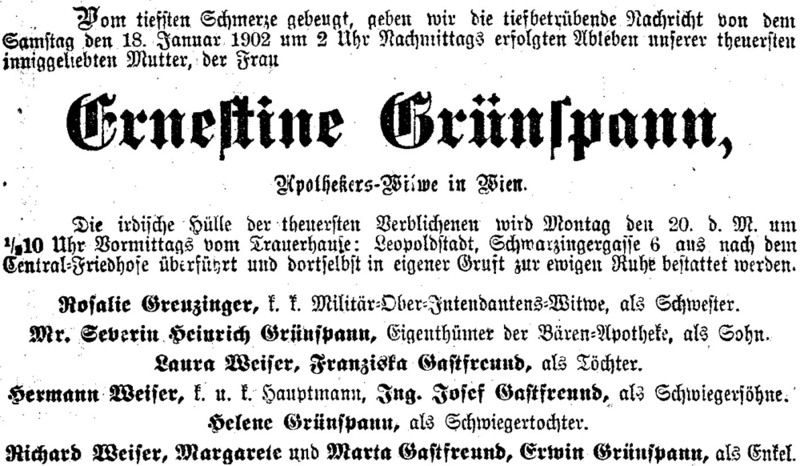 Died: Apr 9, 1870 in Vienna age 23 *geni Siblings: Carl Oppenheim, Adolf Oppenheim same?, Theresia (Therese) Oppenheimer (2/29/1832 Bratislava m. 1/8/1854 Vienna - 4/25/1912 #9 Marc Aurelstraße, Vienna-1) NFP & David Geiringer (12/12/1824 or 1/9/1825 Stupava res. Vienna 13, Gloriettegasse 15/1, Salzgries 1 - 5/25/1898 Vienna) textile trader draper NFP <son of Leopold (see Geiringer family) & Leny Kary *geni> Father: Leopold Oppenheim Mother: Regina Steiner *geni *Samuel is buried with his 2nd wife Pauline, son Walter and currently unknown Arnold Friedmann (1866-7 - 2/28/1942 bur. Vienna Zentralfriedhof-I Tor group-20 row-1 grave-1) also on Friedmann's misc. note & same as on *geni? 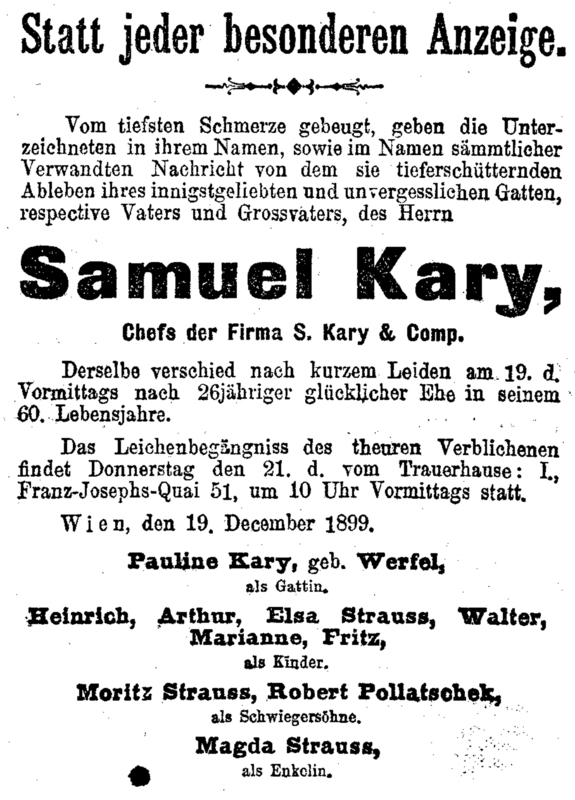 Note: Samuel Kary - Chefs der Firma "S. Kary & Comp." S.K.&Co. (Seidenwarenhaus, gegründet 1864 (damalige Adresse: Lugeck 4, 1010 Wien) silk textile company, with a manufacturing plant in Fischamend , Lower Austria and a nice building in Vienna, where they housed their head office and the retail business selling silk by the meter to the public. Both Arthur and Walter joined the company and since Arthur was the elder, he was in charge. 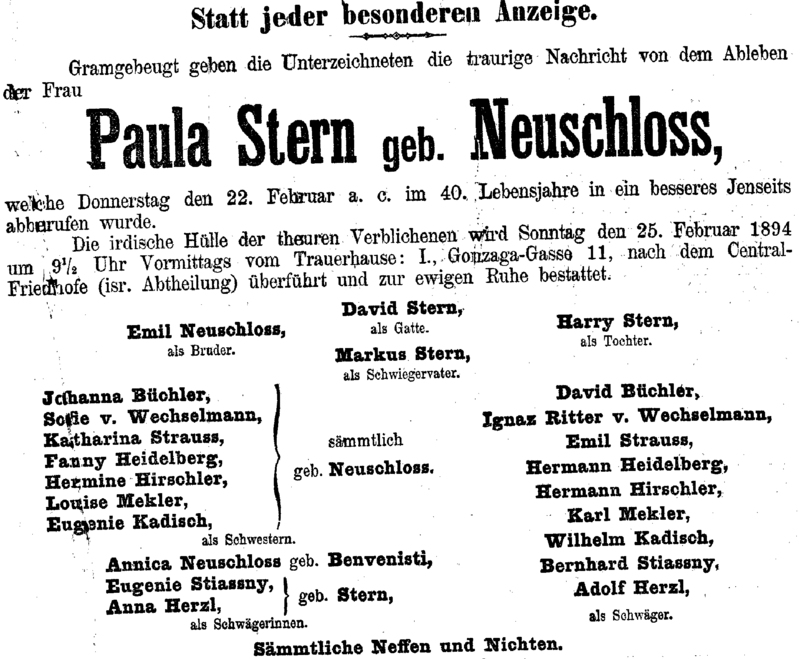 *see image of Sidenwarehaus in Wien 1 gegrundet 1864, 1914 *see 2pg Apr 9, 1870 of 54 pages of Pauline (Kary) Stone "Mymem memoirs"
Note: any relation to Robert Pollaczek (Dec 9, 1872 - ) on avotayny holocaust list OR Liquidiert Lederfabrik Robert Pollaczek Rannersdorf Nach dem Plan der WSt ebenfalls zur Liquidation vorgesehen war die Robert Pollaczek Ledersfabrik GmbH in Rannersdorf. 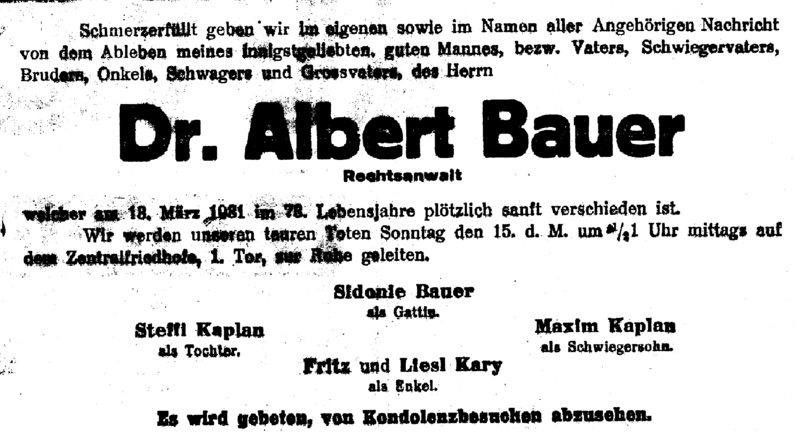 Dieses 1899 gegründete Unternehmen produzierte Schuhoberleder und Portefeuilleleder. 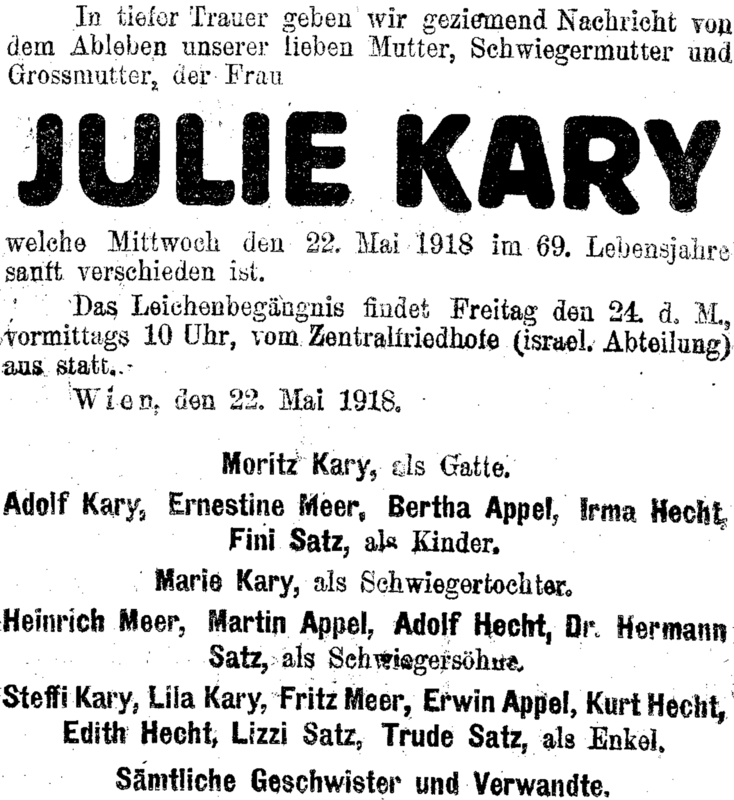 Die Firma beschäftigte 1937.. Prokurist war Dr. Franz Pollaczek, der im Juli 1938 nach Amerika emigrierte OR Marianne Pollaczek ( - 1968 Cook, Illinois) on Ancestry death index ? 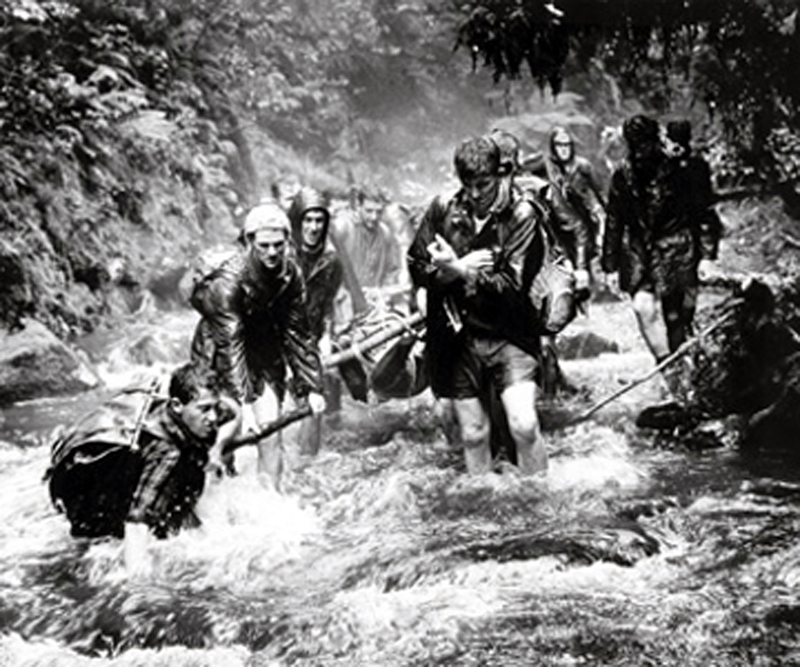 Note: see "..The Tararuas claimed 55 lives between 1900 and 2003. 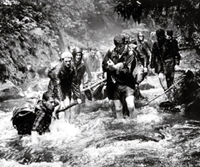 The body of Peter Langer presented a challenge to men sent to retrieve him in 1964.. Barry Durrant". 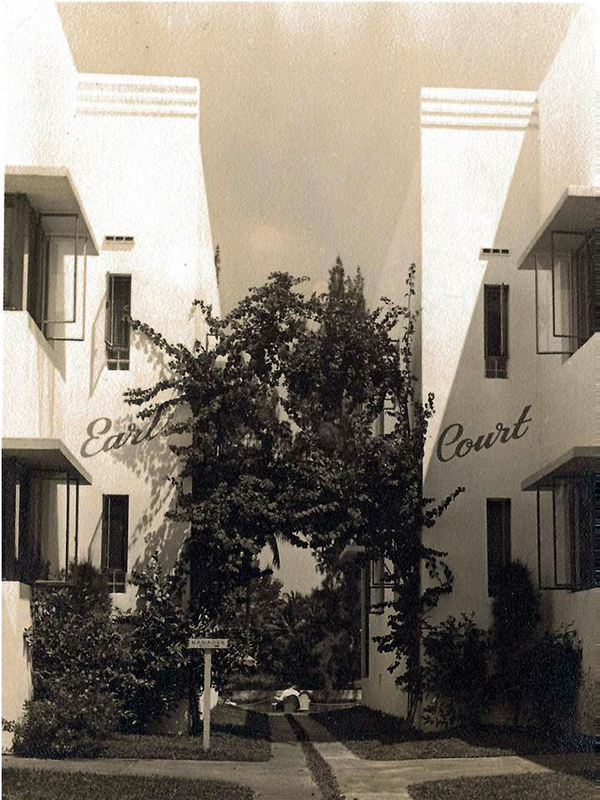 Jacob Langer & Melanie had their apartment furniture designed by Adolf Loos *Geni path. Their furniture was brought to Australia from Vienna by their daughter Elizabeth Muller and was given to the National Gallery of Victoria (article) after she died. The gallery now has the biggest collection of Adolf Loos furniture in the world. *ref. Adolf Loos (below) projects includes 1901-1903 Piso de Leopold Langer, 1903 Casa de cambio de Leopold Langer, Viena & 1903 Piso de Jakob Langer, Vienna. 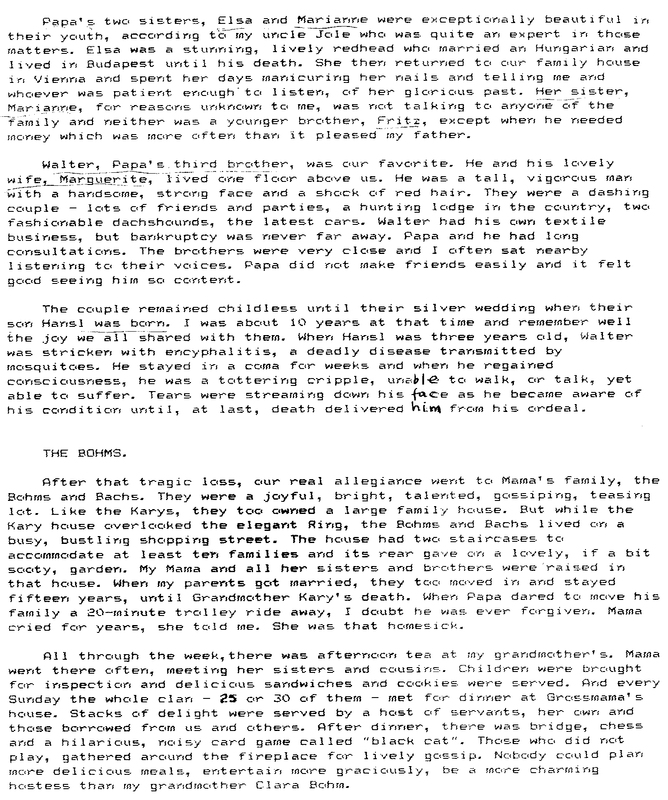 Note: see Adobe article, featuring an interview with Sue Course and an account of her Langer & Gallia family’s connection to competing architects Adolf (see Loos family) wikipedia, ref. and Josef Hoffmann wikipedia, and her family furniture at the current exhibition of Vienna Art and Design at the NGV.. 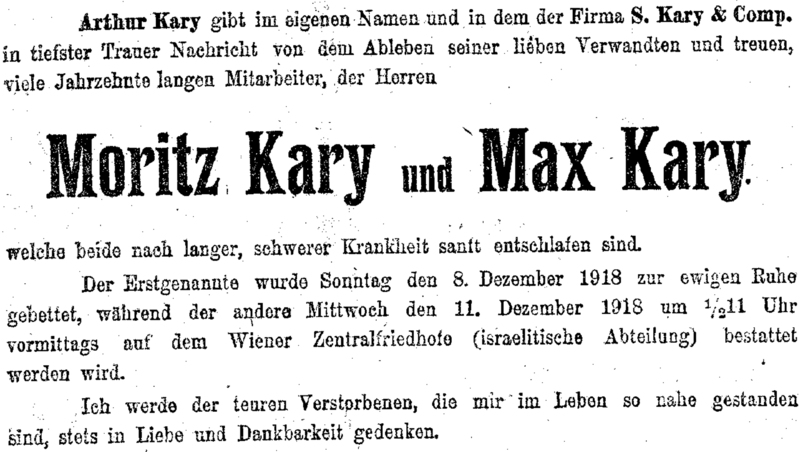 Note: Arthur Kary bought Walter out of Seiden Kary and Walter bought Ignaz Selinko out, after having worked with him for a little while. 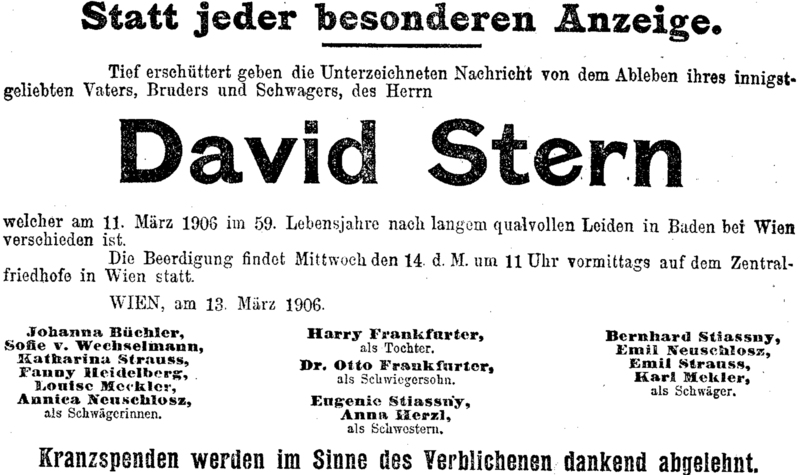 After WW1 when the Austrian Empire ceased to exist, Walter started the manufacturing business, as he was certain that with such a small home market, a trading business could not maintain its dominance in its very large market, which was now many nationalistic little countries, who wanted to rid of their dependence on the previous empire. 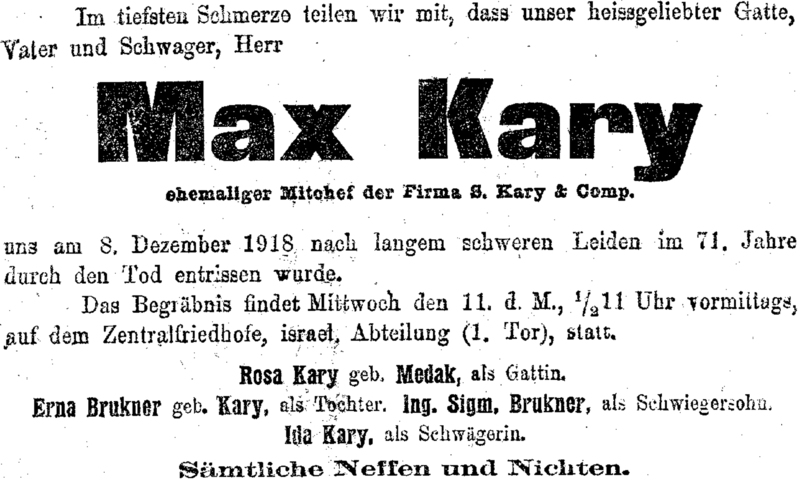 *See extract from book Ökonomie der Arisierung "..In March, 1943 the property of Jewish former companion Margarethe Kary became in favour of the German state drawn.91.. .. Company Brüder Selinko mechanical Weaving mill Inzersdorf. After 1945 the company was under public management. In Industrie Compass 1947/48 the firm is under the name Inzersdorfer Weberrei Dr. Mache & Svoboda K.G. verzeichner? ; Richad Basch.93 was the public Governor. 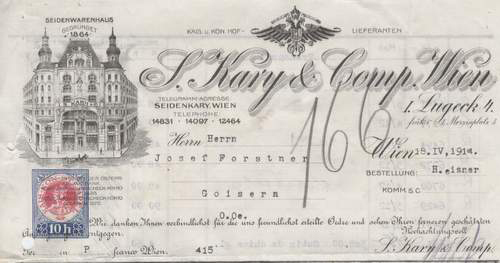 From 1953 the firm appears again under the name Inzersdorfer Weberrei Brüder Selinko in Compass. 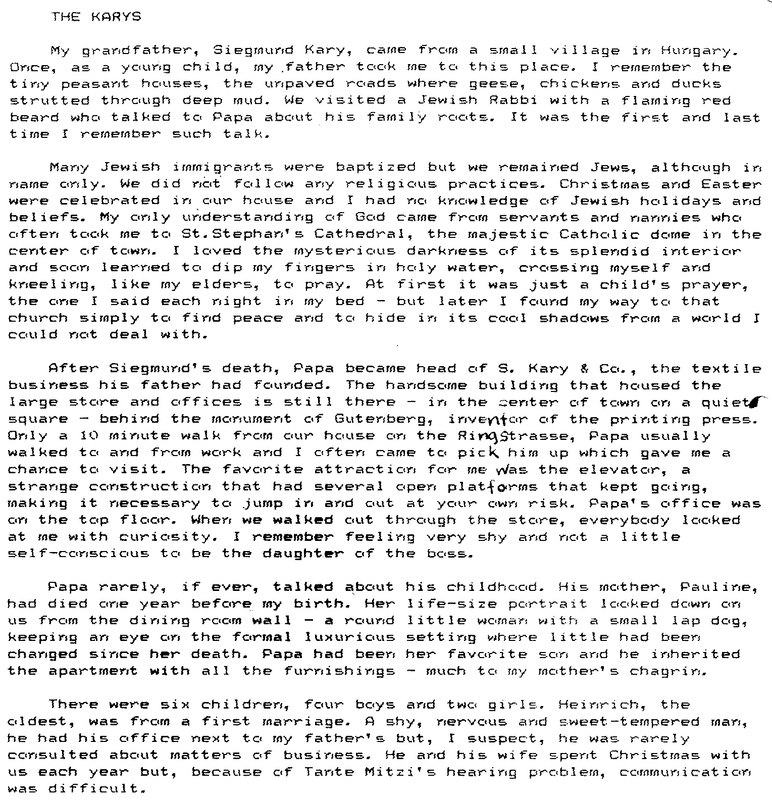 Owner of the firm was at that time again Marguerite Kary, daughter of the company founder Ignatz Selinko, who died in 1935. 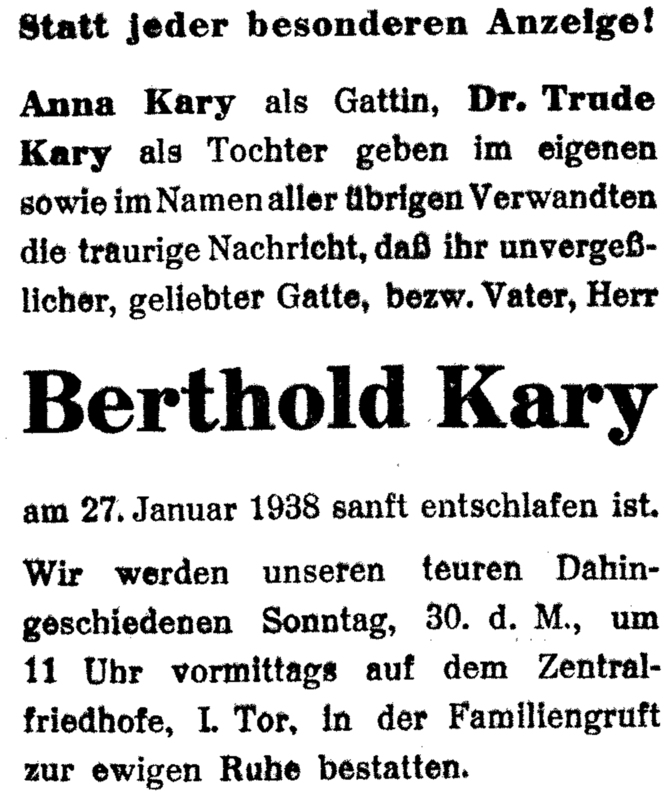 Limited partner was her son Hans Kary again.94"
Group-A: *already added on GENI *see obituary by: "Arthur Kary (above) in his own name and company Kary S. & Comp. 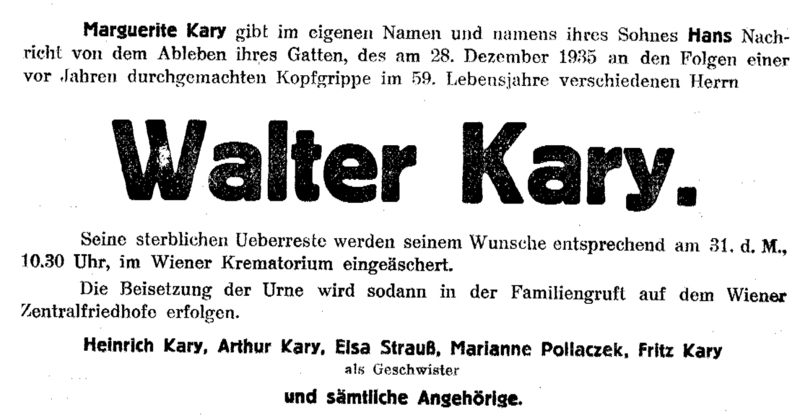 Trane in the deepest message of the death of his dear relatives, faithful for many decades employees Moritz Kary and Max Kary"orig: "Arthur Kary gibt im eigenen Namen und in dem der firma S. Kary & Comp. 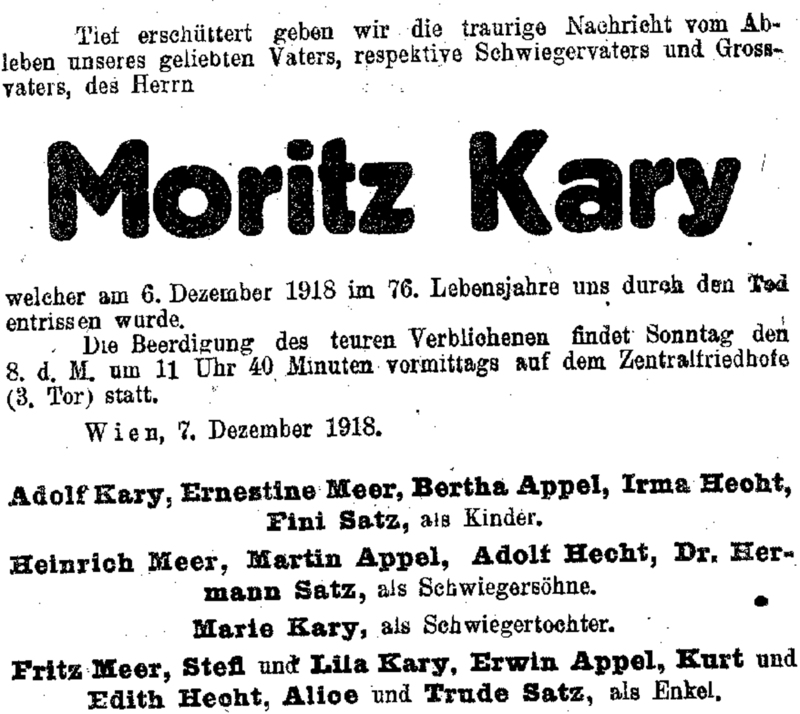 in tiefster Traner Nachricht von dem Ableben seiner lieben Verwandten un treuen, viele Jahrzehnte langen Mitarbeiter, der herren Moritz Kary und Max Kary.."
Note: any relation to Ignaz Neumann, Karl Neumann, Agnes Neumann, Alois Neumann <children of Josef Neumann (1820 - 3/4/1899 Mezno (Prudice /Pruditz), Bohemia) on Prager Tagblatt ? 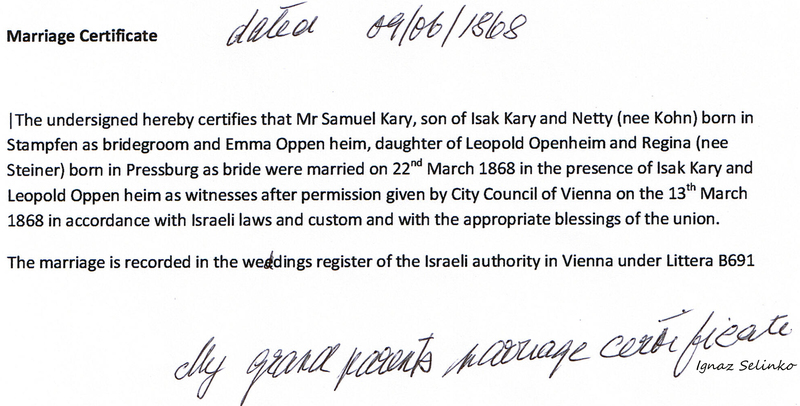 Note: ?same as buried in Vienna; Emanuel Wolf (abt 1835 - bur 6/8/1881 Vienna) with Anna (?) 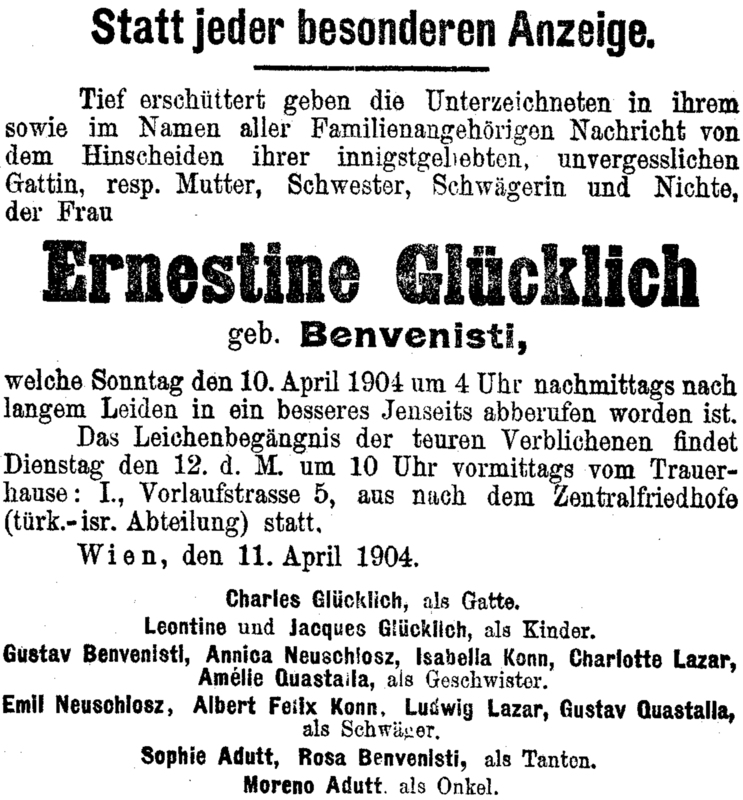 ( - bur 3/27/1924 Vienna) ? 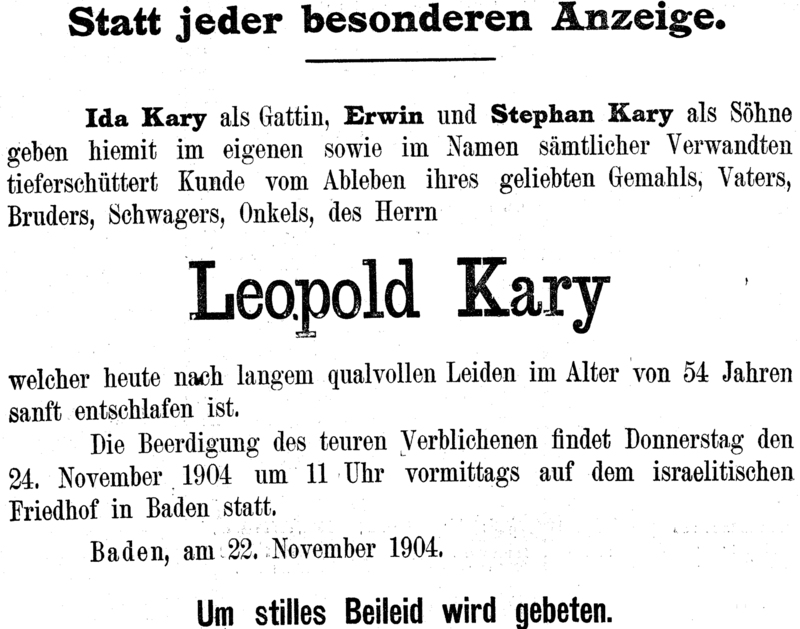 Yad Vashem lists Kary individuals from: Rosenberg =Olesno?, Bankau =Bąków?, Gliwice (Gleiwitz), etc. 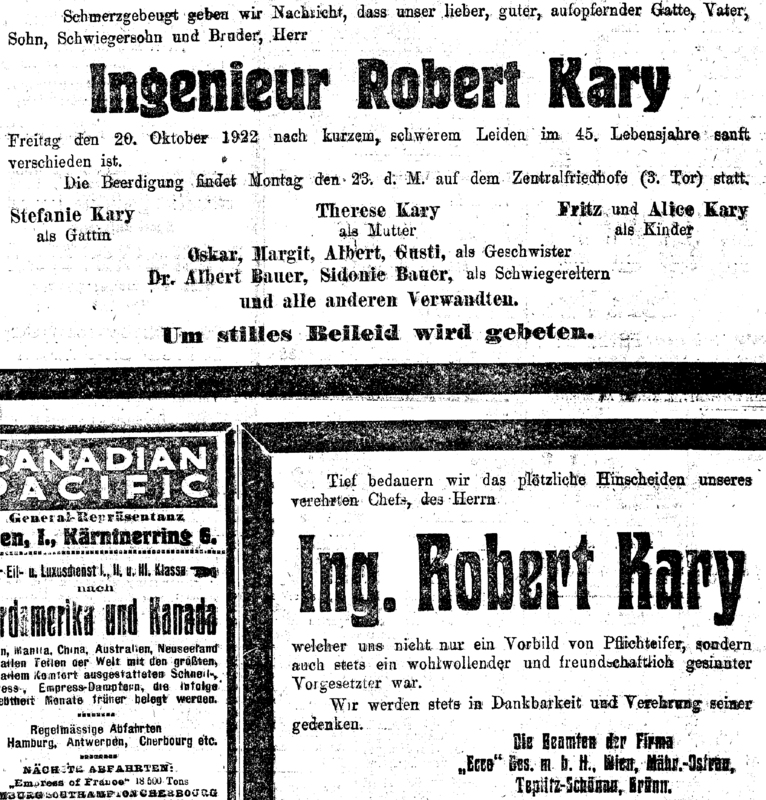 Isidor Walter KARY (15.1.1858 -) *?same as married to Betty Schiller ( m. 1888 Ottakring =Vienna-16 - ) genteam "ch. 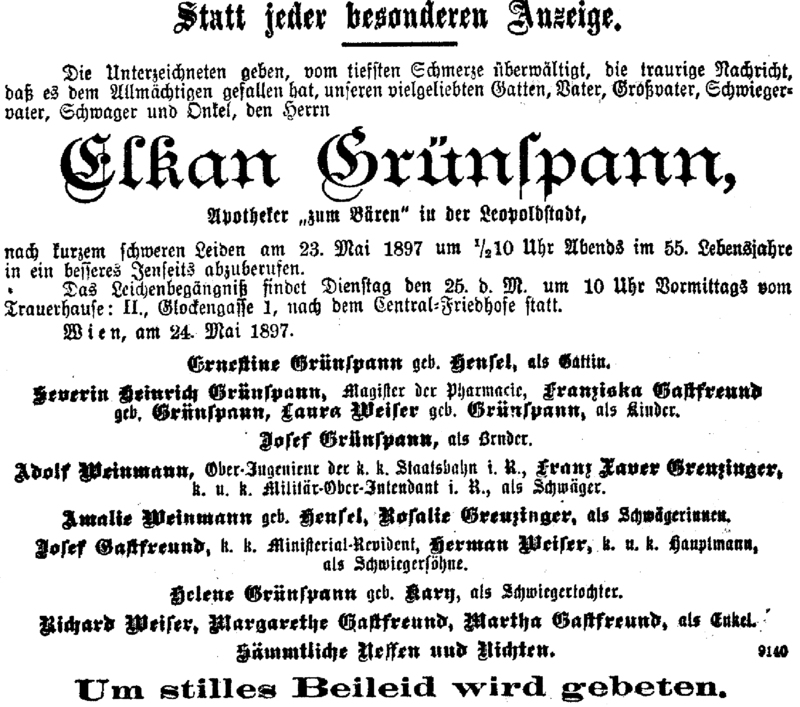 Johanna Maria (1889 Ottakring - )" genteam *same as? Betty Schiller (1863 - ) daughter of Adol Schiller & Anna Schindler genteam ? Aron (Arje) KARY born in Vitke, country? 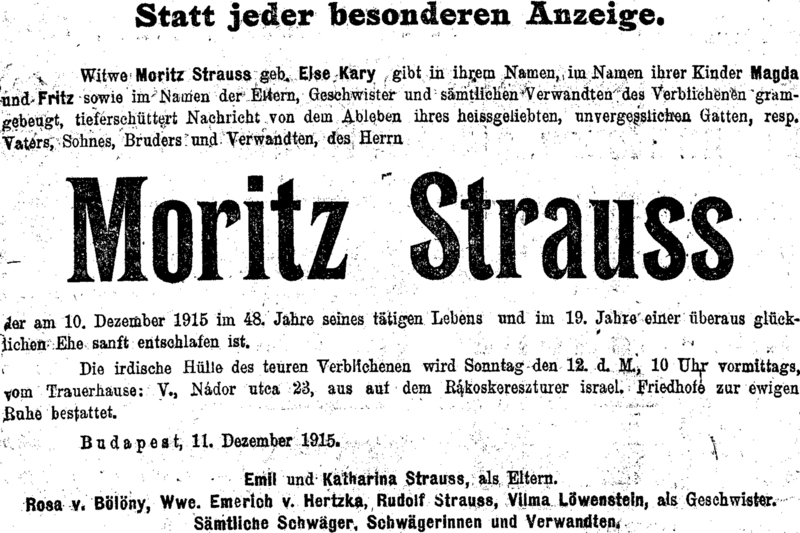 + Hanni (Hencse) FRIEDMANN in Vari, country? *Hungarian Births Database "LDS 642905, Vol. 6"